When my kids realized that school was coming to an end this past spring, they were initially a little disappointed. After all, they both adore their teachers, friends, learning — everything that comes together to make school fun! However, it didn't take long before the girls realized that summer comes with its own selection of entertaining that can prove to be just as gratifying. Pool parties have replaced carpools, ice cream has overtaken the food pyramid, and there is a constant search for lawn sprinklers. Who wouldn't be excited for three months filled with backyard barbeques, beach trips, and play date picnics? This year, we have found our new favorite place to purchase everything we need to make the most of summer is none other than Target. Their affordable variety of bright colors and fun patterns splashed across everything from melamine dinnerware to picnic baskets manages to deliver the practicality our outdoor parties need in the styles we crave! While we have long loved Target for their collections of... well, everything, I'm thrilled with the way that the store is constantly reinventing itself and staying on top of trends and styles. No matter if your summer is filled to the brim with plans or you're just looking forward to throwing on your flip-flops to spend time with family and friends, whatever you need can be found at Target. Therefore, I wasn't surprised when I discovered that Target is currently running a creative Big Honkin' Summer campaign that features a collection of various warm weather items that the entire family is sure to love! Target is the destination for everything families need to make the most of summer. Whether you are traveling to the beach or just want to keep the kids busy, Target has all the summer essentials at great prices to make the most of the season. 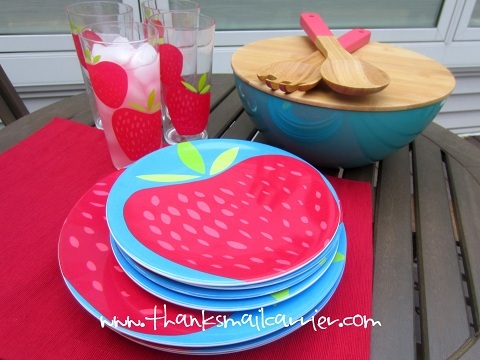 When a selection of summer entertaining products arrived, I was immediately excited to check out the bold graphics and vibrant colors on the tabletop pieces and picnic must-haves to help us make the most of summer. Talk about affordable style! 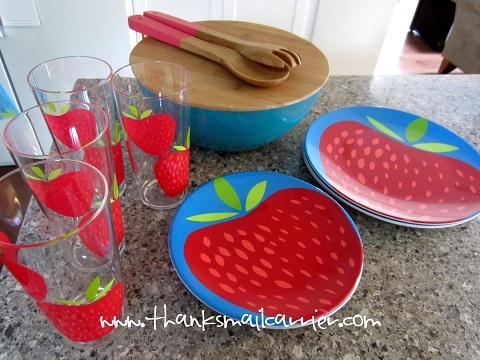 The bright, bold colors and graphic strawberry design was just right to brighten up our summer and I knew it would be perfect for any summer party or gathering. We have typically pulled out plain paper plates for outdoor entertaining but, without a doubt, these items would definitely add a splash of fun and excitement to our normal routine. As I began planning our next party, I was happy to see that the shiny melamine was dishwasher-safe so that I already knew that at the end of the day I would only have to load up the dishwasher (as opposed to standing in front of the sink). Instead, it was just right to pull out and let guests load up their plates and fill up their glasses quickly and easily. 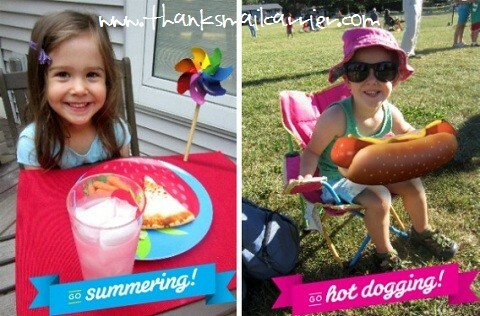 These summer entertaining products were definitely a hit! They were immensely more attractive than our paper plates, much more durable and sturdy, and just by setting them out they were able to liven up our decor. I couldn't be happier with the vibrant colors and designs, the eco-friendly properties of the bamboo lid and serving utensils, and the instant fun that these provide. 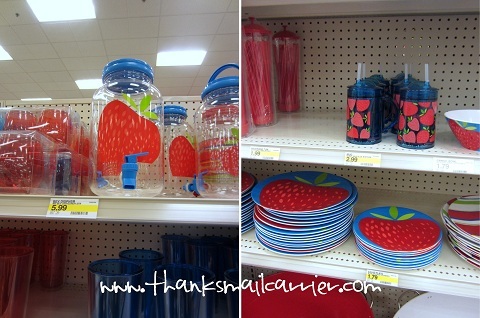 I've already been browsing Target's summer catalog to see what other affordable items they offer that would enhance these summer entertaining essentials... and, during a recent shopping trip, the girls and I happened to come across them as well. We were excited about the matching cups, bowls, drink dispenser and more that would be a great fit for our future outdoor fun, as well as the lines featuring solids, stripes and other great graphic designs. As you busily prepare for block parties and cookouts, Target can provide hours of outdoor fun and entertainment with their Big Honkin' Summer collections of essentials, games, toys, lemonade stand kits and more. Keep an eye out in stores for the giant photos of beach balls, sunglasses and sand buckets that direct you to the colorful summer merchandise and find out more at Target.com as well as on Facebook. While you're there, you'll also want to check out the "Summer-izer" Facebook application that allows you and your kids to add Big Honkin' Summer icons to photos, and then share online or print at a local Target Photo Center. Just another way that Target is helping you make everyday moments more memorable this summer! I wrote this review while participating in a blog tour by Mom Central Consulting on behalf of Target and received products to facilitate my review and thank me for taking the time to participate. That Summer Entertaining Essentials package is really cute and definitely perfect for summer entertaining. Love that there are other matching accessories available as well. 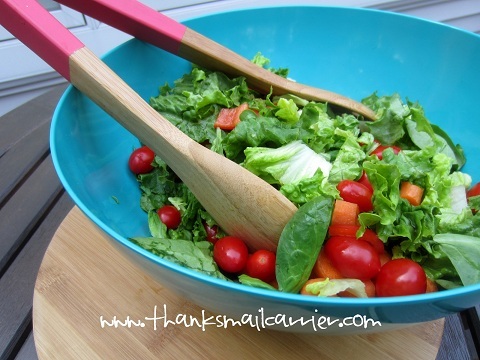 Also, that is one delicious looking salad! Yay for Target! That is my favorite place to shop! :) Love that summer set!